The girth is the widest point of a person's abdominal area and is best measured with a tape measure to obtain the circumference of the girth. The word girth now means circumference - you can measure the circumference of any part of the body but the original meaning was a yard (36 inches). Girth measurement is very important to make a garment. Now I will discuss different girths of human body. It is a measurement of the maximum horizontal girth of the head. The measurement is taken from above the eyebrows and ears and around the back of the head. 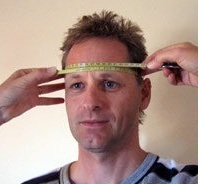 The head girth measurement is taken at the level immediately above the eyebrows & ears & around the back of head. When recording, you need to make sure the tape compresses the hair and is kept horizontal. Also make sure there are no ties or clips in the hair, and that the ears are not included. This measurement is important for make a garment that will pass the head flexibly. It also needs to make head covering apparel. 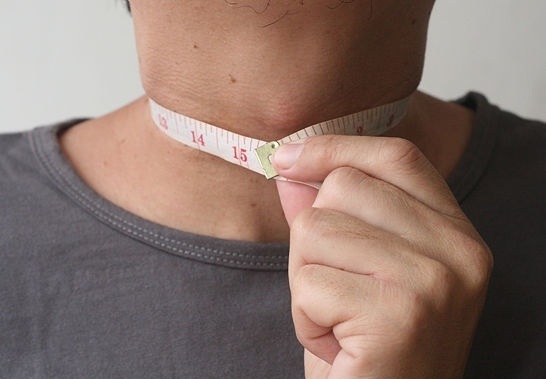 It is a measurement of the girth of the neck. The measurement is taken by placing the tape comfortably around the base of the neck. The base of the neck is where the curve starts at the bottom. The subject should keep their head up and looking straight ahead. When recording, it is needed to make sure the tape is not too tight or too loose, is lying flat on the skin. This measurement is taken to make the garment stable & flexible in neck. It is the measurement of the girth around the arm joint. This measurement is taken by placing the tape around the arm joint. Please make sure one will be comfortable for this girth, whatever arms raised up or raised down. Must keep the tape not too tight or too loose & must lying flat on the skin. This measurement is used to make the garment flexible on armhole whenever arms rose up or down. It is a measurement of the widest girth of the chest. The measurement is taken at the widest point of the chest which is just above the bust. This measure is taken by placing the tape just above the bust & passing the tape under the arms. After the tape is in position, the arms should be relaxed by the side, and the measurement taken at the end of a normal breathing. When recording, it is needed to make sure the tape is not too tight or too loose, is lying flat on the skin, and is horizontal, particularly around the back. 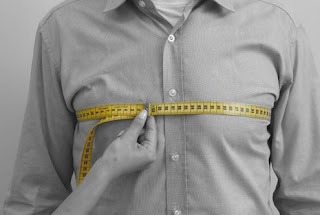 This measurement is used to give the chest shape of a garment. It is a measurement of the maximum horizontal girth of the bust. The measurement is taken by placing the tape over the fullest part of the bust & around the back. The measurement taken at the end of a normal breathing. When recording, it is needed to make sure the tape is not too tight or too loose, is lying flat on the skin, and is horizontal, particularly around the back. This measurement is used to make the garment. It is a measurement of the girth just under flexible or tight fitting on bust. It is the measurement of the girth just under the bust. The measurement is taken by placing the tape around the body just under the bust. When recording, it is needed to make sure the tape is not too tight or too loose, is lying flat on the skin, and is horizontal, particularly around the back. 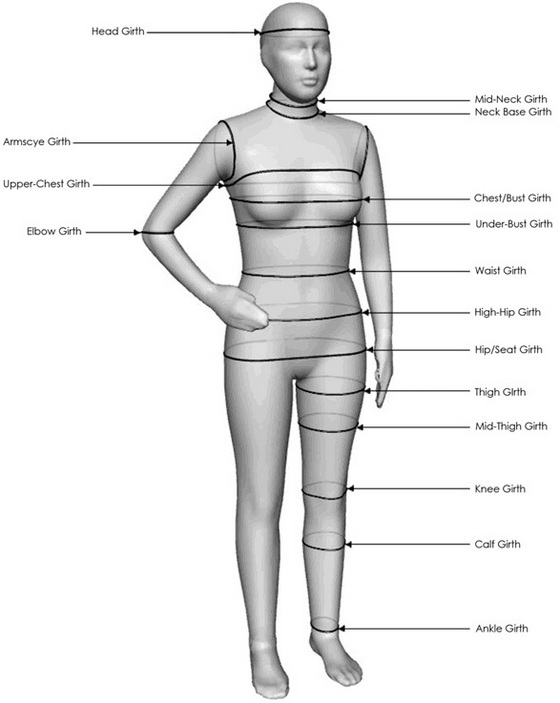 This measurement is use to make body fitting or flexible garments. It is a measurement of the narrowest girth of the waist. 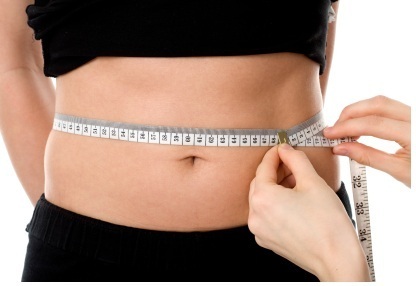 This measurement is taken by placing the tape around the narrowest part of the waist, usually above the belly button. If you are unsure if this measurement was taken at the narrowest level, take several measurements at different levels and take the lowest measurement. Must keep the tape flat & horizontal to the floor & not too tight or too loose & must lying flat on the skin. The measurement is used to make the bottom part of the garments & to make the garments comfortable at that part. It is a measurement of the smallest girth of the wrist. 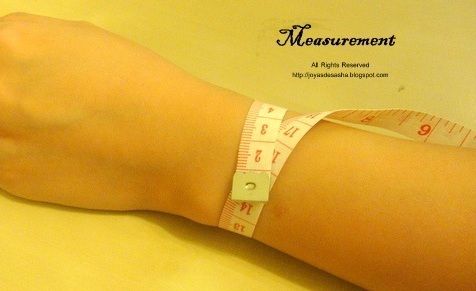 This measurement is taken by placing the tape around the narrowest part of the wrist, usually above the wrist bone. Must keep the tape flat & horizontal to the floor & not too tight or too loose & must lying flat on the skin. This measurement is used to make the cuff of a garment with actual measurement. It is a measurement of the fullest girth of the hip which is usually over the bottom. This measurement is taken by placing the tape around the fullest part of the hip which is usually over the bottom. Must keep the tape flat & horizontal to the floor & not too tight or too loose & must lying flat on the skin. This measurement is used to make the garment flexible on the hip & that will not tear off at the time of wearing. It is a measurement of the thickest girth of the thigh. This measurement is taken by placing the tape around the thickest part of the thigh. Must keep the tape flat & horizontal to the floor & not too tight or too loose & must lying flat on the skin. This measurement is used to make the garment easy fitting at the time of sitting somewhere. It is a measurement of the girth of the knee. This measurement is taken by placing the tape around the middle part of the knee. Must keep the tape flat & horizontal to the floor & not too tight or too loose & must lying flat on the skin. This girth is used to make the garments flexible or body fitting on knee. It is the measurement of the narrowest girth below the knee joint. This measurement is taken by placing the tape around the narrowest part under the knee. Must keep the tape flat & horizontal to the floor & not too tight or too loose & must lying flat on the skin. It is the measurement of the widest girth of the calf. This measurement is taken by placing the tape around the widest part of the calf. Must keep the tape flat & horizontal to the floor & not too tight or too loose & must lying flat on the skin. 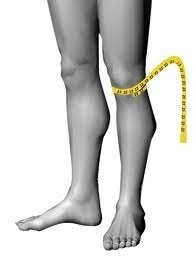 This measurement is used to make the garments flexible or tight fitting under the knee. It is the measurement of the smallest girth of the ankle, just above the ankle bone. This measurement is usually taken on the right side of the body, by placing the tape around the narrowest point of the ankle. Must keep the tape flat & horizontal to the floor & not too tight or too loose & must lying flat on the skin. This measurement is used to make the garment flexible on ankle.